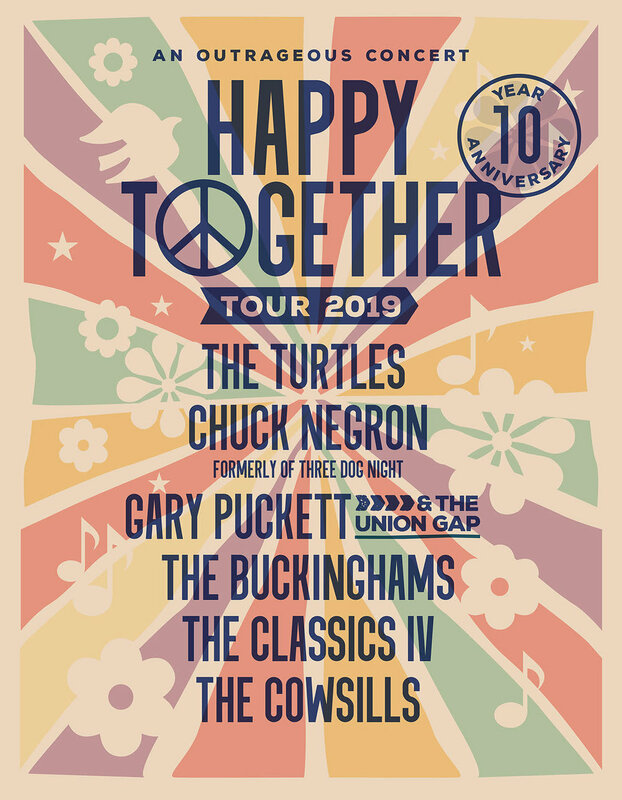 HAPPY TOGETHER RETURNS TO THE PARAMOUNT THEATRE IN ASBURY PARK! The Greatest Pop Rock Hits of the 60's-70's! The audience will go home whistling the soundtrack their lives! Produced by UMTPresents, Sammy Boyd Productions and Madison Marquette for the LODF, a 501 C3 Non-profit Org. Denny Laine is a Grammy winning artist and founding member of The Moody Blues & Wings with Paul McCartney. Throughout his career, Denny Laine has also worked with members of The Beatles, The Who, Led Zeppelin, Cream, ELO, The Zombies, the Hollies and many more. Denny is a Grammy winning singer,songwriter musician & Rock n Roll Hall of Famer. Denny was one of three constants in Wings, along with Paul and Linda McCartney. Denny will be performing highlights from Band on the Run , the Magnificent Moodies and other albums. Premier English singer, songwriter & multi-instrumentalist, Denny is best known for is roles as the original Lead Singer & guitarist of The Moody Blues from 1964 through 1966. As co-founder of Wings with Paul McCartney, Denny was one of the three constants in Wings – Paul, Linda & Denny – from 1971 through 1981. The incomparable Wings album ‘Band on the Run’ reached #1 in the Billboard Hot 100 Charts – 3 different times, the album went triple platinum. In 1975, Wings won a Grammy for Band on the Run, the single and title track. At the height of the British Invasion, Denny Laine was one of the most recognizable voices on the music scene. Good Stuff comes to Asbury Park! Featuring the music of Steely Dan, Sting, Gino Vanelli & Stevie Wonder. One band, one stage, one night performing the music of four of the greatest musical artists of our time. Band members include Mike Caputo, Axel Belohoubek, Jay Dittamo, Don Regan, Scott Hogan, Phil Armeno & Deanna Carroll. Peter Asher & Jeremy Clyde - Two legends of the British Invasion Era Together on One Stage! "The duo oozed a refreshing abundance of natural English good humor and charm as they told tale after tale from their fabled careers...their voices blended seamlessly...(they) sound virtually identical even 50 years later." Peter Asher of Peter & Gordon joins forces with Jeremy Clyde of Chad & Jeremy to star together in an unforgettable evening of music and memories featuring songs and stories from their sixties heyday as recording artists to Jeremy's success on stage, television (Downton Abbey) and film (The Iron lady) and Peter's Grammy-Winning career as Producer and manager of the likes of James Taylor, Linda Ronstadt and more. Their respective British Invasion duos were collectively responsible for 30 Billboard chart hits. From the Chad & Jeremy catalog, they bring you "Distant Shores", "Yesterday's Gone" "Willow Weep For Me", "Before and After", "A Summer Song" and more. From the Peter & Gordon songbook comes "Woman", "I Go To Pieces", "I Don't Want To See You Again", "Lady Godiva", "A World Without Love" and more. Don't miss this special opportunity to hear the stories behind the lives and music of these two legendary duos from the era that wiped clean and drew again the face of popular culture. Darlene Love, with Special Guest Pat Guadagno, returns to Red Bank. Performing the holiday classics and her own greatest hits. This year's presentation is a part of Little Steven's Underground Garage at the Basie. The holiday season is finally here, and there's no better way to kick it off than by combining a memorable evening of live music with the holiday spirit of giving. The Asbury Park Music Foundation proudly presents the 1st Annual “A Very Asbury Holiday Show” to benefit the Asbury Park Toy Drive, The Boys & Girls Club of Monmouth County, The Asbury Park Music Foundation & Jewish Family & Children Services! “Join us on December 9, 2018 at the Paramount Theater when musicians from Asbury’s past meet to jam with Asbury’s present and future! Some of these outstanding musicians of various ages and backgrounds will be sharing a microphone for their very first time on the Paramount stage. It’s going to be a magical, musical night!”, said Eileen Chapman, APMF board member and one of the organizers of the holiday concert. The line-up includes Danny Clinch and Tangiers Blues Band, the Weeklings, Kings of Suburbia, Remember Jones, Williams Honor, Bobby Bandiera, Des Spinks, Layonne Holmes, JT Bowen, Eddie Testa, Waiting on Mongo, Jillian Rhys McCoy, Billy Hector, Brian Kirk, Joel Krauss, Anthony Krizan (Spin Doctors), CC Coletti (Meatloaf) and many more. Musical Director Tony Perruso will lead an all-star band featuring members of the Pat Roddy Band: Greg Mayo, Graham Maby, Rich Scanella, Arne Wendt, Chris Giunco, Vinny Kucinski, John Walby, Joey Stann, Tommy LaBella, Tom Meares, Doug DeHays, & Bob Giunco. Tickets for the December 9th “A Very Asbury Holiday Show” begin at $20 and are available through Ticketmaster or the Stone Pony box office. The concert begins at 7pm. Visit http://asburyparkmusiclives.org/ for more information. “We look forward to making this an annual event that supports the surrounding community in so many ways; from fostering live music collaborations, to benefitting charities that help local families and individuals and by encouraging visitors to visit Asbury Park’s exceptional shops, restaurants, art galleries and music venues”, said Pat Roddy, performer and one of the concert organizers. The Asbury Park Music Foundation has been hosting a series of summer concerts in Springwood Park and the Asbury Park Boardwalk and more recently the Sunday Sessions, an intimate afternoon of music and interviews at the APMF space at Lakehouse Music Academy. The Foundation offers life-changing music programs that provide under-served youth with confidence, discipline and relationships that improve their future success and economic mobility. The Asbury Park Toy Drive helps hundreds of families in Asbury Park by providing toys as well as much needed winter coats to those in need. As the demand has grown for families who needed help, this charity has been able to sponsor field trips and get back-to-school supplies for kids. But Christmastime is their passion. The organization will be collecting unwrapped toys in the lobby of the Paramount Theatre on the evening of the concert. Jewish Family and Children’s Services of Monmouth County provide innovative, responsive, cost effective, non-sectarian human services that enhance the quality of life for children, families and the aged in our community. Some of this support extends beyond what can be accomplished within the confines of their office. It might include home delivery of food for someone who is not ambulatory or shopping for someone who cannot afford to buy the foods that are required for one on a restricted diet. At the core of these efforts is the belief that people need to feel welcome and connected to those who care about their well-being. The Boys & Girls Clubs of Monmouth County is a private non-profit organization that serves children that come from some of the most difficult circumstances in the County. Their outreach includes providing a safe environment to learn and grow, fostering ongoing relationships with caring adult professionals, providing life-enhancing programs and character development experiences while providing hope and opportunity. Louie DeVito's Dance Factory returns to Convention Hall on the Asbury Park Boardwalk. Featuring live performances from Amber singing all her hit songs including "Sexual", "Yes! ", "This Is Your Night", "One More Night" & "Above The Clouds" and Ultra Nate singing her club anthem "Free"! Louie will be spinning an open to close set from 8pm until 2am!! The Trammps go down in music history as the first official band of the dico era. Best known for their Grammy winning song, "Disco Inferno" that became not only a staple in the dance clubs but the psuedo theme song for the disco movement. Originally released in 1976, it was the song's inclusion in the Saturday Night Fever Movie soundtrack, that brought the band world wide fame. You've seen the Disco tribute shows, now come out and see the act that helped create a movement! Earl Young continues to bring the very best of The Trammps' legendary dance music audiences around the world. From the White House to Madison Square Garden, Brazil to Japan and Disney land to Hammersmith. Whether you donned your dancing shows in the 70's or are enjoying the music for the first time - Now is the time to experience The Trammps live! Prepare to fall in love again with the music of Simon & Garfunkel. From their startlingly authentic rendition of Sound of Silence to their playful version of Cecilia, Jeb & Jock Guthrie will have everyone in the room smiling and singing along. The show highlights the brothers' deep spiritual connection to the music. It is no secret that the music of Steely Dan is probably the most original, complex, and interesting music of our time. Since April of 1994, The Royal Scam, the world's premier Steely Dan tribute band, has been performing in some of the most respected jazz clubs, showcase rooms, and festivals, and receiving rave reviews. They have developed a following from Maine to Virginia and continue to gather new fans with each and every performance. The Royal Scam has helped to keep the compositions of Donald Fagen and Walter Becker, the spirit of rock/jazz, and the enthusiasm of fine musicianship alive and well in the NY metropolitan area.